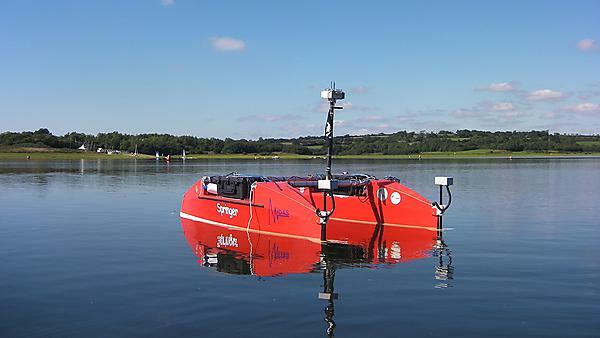 A multi-disciplinary research project has been carried out at the University of Plymouth to design and develop an Unmanned Surface Vehicle (USV) named Springer. The work presented herein relates to formulation of a robust, reliable, accurate and adaptable navigation system to enable Springer to undertake various environmental monitoring tasks. Synergistically, sensor mathematical modelling, fuzzy logic, Multi-Sensor Data Fusion (MSDF), Multi-Model Adaptive Estimation (MMAE), fault adaptive data acquisition and an user interface system are combined to enhance the robustness and fault tolerance of the on board navigation system. This thesis not only provides a holistic framework but also a concourse of computational techniques in the design of a fault tolerant navigation system. One of the principle novelties of this research is the use of various fuzzy logic based MSDF algorithms to provide an adaptive heading angle under various fault situations for Springer.